We wanted to not get to Storm King close to when they opened, so we woke up early enough to get showers and have a quick breakfast. There is, though, one interesting about our room. It did have a bathroom and shower, but things were arranged so entering from the hall, you first enter the bathroom, then go through another door to the rest of the room. Not a normal arrangement. 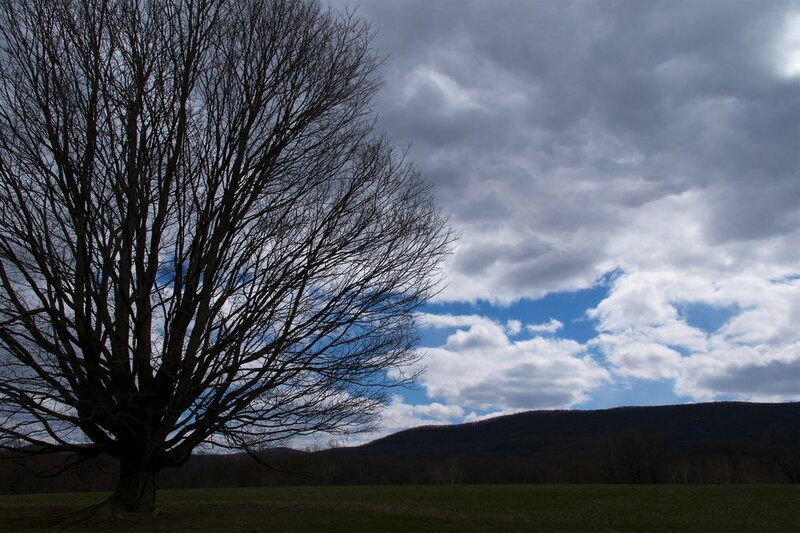 The short drive south was pretty uneventful, and we arrived at Storm King Art Center not long after they opened. 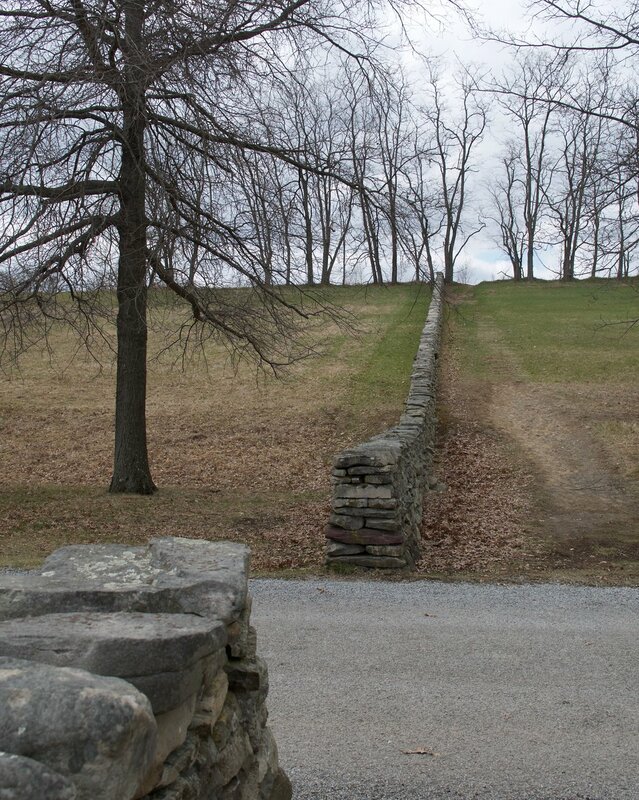 Because of the wide-open nature of the place, you pay your admission at the entrance gate. 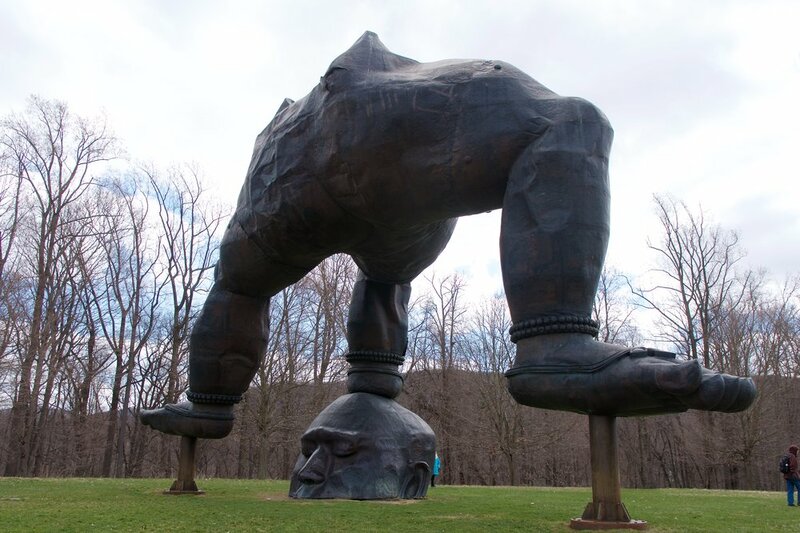 When we drove up, there was a sign saying that the person in the gatehouse was in training; we figured that since Storm King opened for the season just a week prior to our visit, the person probably had at least a little time under his belt. We saw several interesting pieces on the way in, including what looked like a Calder (it was). Following attendant directions, we parked at the visitor center near the top of Museum Hill. It didn't take us long to realize that it would be very cold during our visit, but fortunately, I had a knit cap and mittens, so Melody used the mittens and I wore the cap (borrowing the mittens every now and then); towards the end of our visit it warmed up. It didn't take us long to realize that we needed to come up with a strategy since wandering randomly would take a long time. The museum map showed some works in photos for each of the four general areas, so we decided to try to find all of those, check out the interactive works, and find a few from artists we recognized. After a little while, we got our bearings and worked our way around Museum Hill. Next up was the South Fields, the largest of the areas. It took us quite a while to work our way around that section. We timed things so we would be near the café after finishing the Meadows, in time for a slightly late lunch. Getting a chance to sit and warm up for a bit was going to be welcome. Not quite, since the café was essentially a large picnic shelter. We did order chili to help us warm up, then we tried to finish our food quickly so we could get moving again. Only the North Woods was left to finish, and it was pretty easy to find all of those pieces. The last thing we did was find and walk along all of the segments of the Moodna Creek Trail, which went along the outside of the park, following the Moodna Creek (no surprise there). We then went back towards the Visitor Center, looking at a couple more pieces, then figured walking 7–8 miles around the park was probably enough. 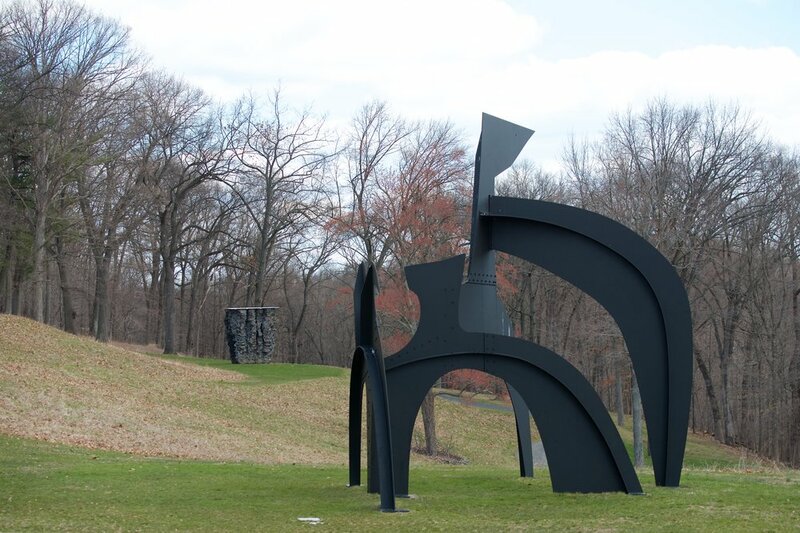 Alexander Calder has several pieces which are all anchors in the park. You see The Arch as you drive in. Five Swords and Black Flag are visible from many parts of the park. 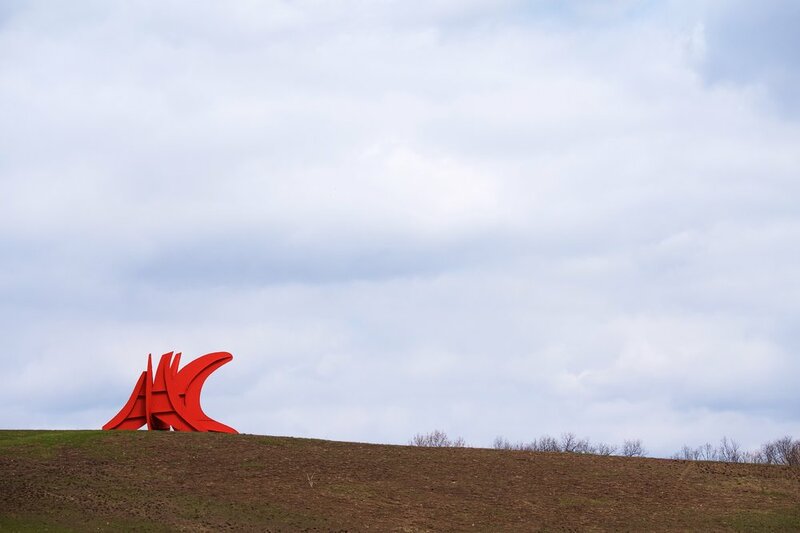 Calder's Eagle is one of the most iconic pieces at the Olympic Sculpture Park in Seattle. 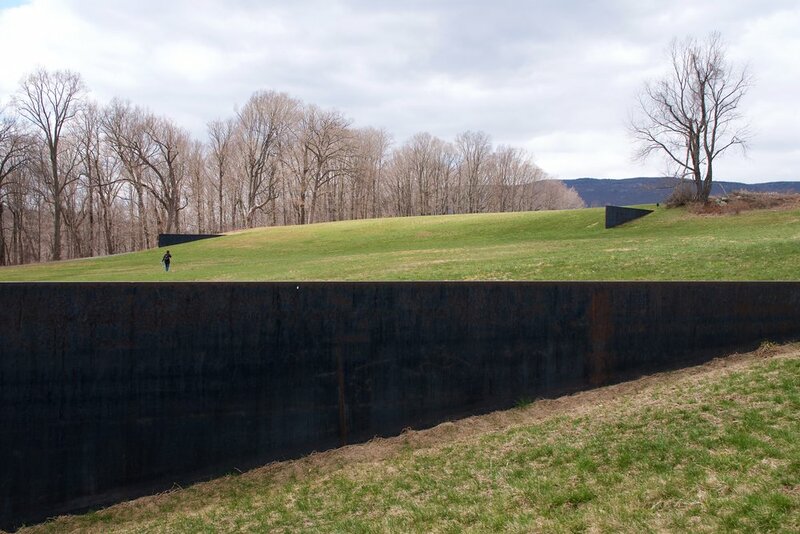 Richard Serra's Schunnemunk Fork was commissioned specifically for Storm King. It covers a huge area on the side of a hill. Serra's Wake is also at the Olympic Sculpture Park. Alexander Liberman has a few pieces, but Iliad bears a very strong resemblance to his work at Seattle Center, Olympic Iliad. Kenneth Snelson's Free Ride Home reminded me of a similar piece on the Stanford campus. Yep, Mozart I is his. 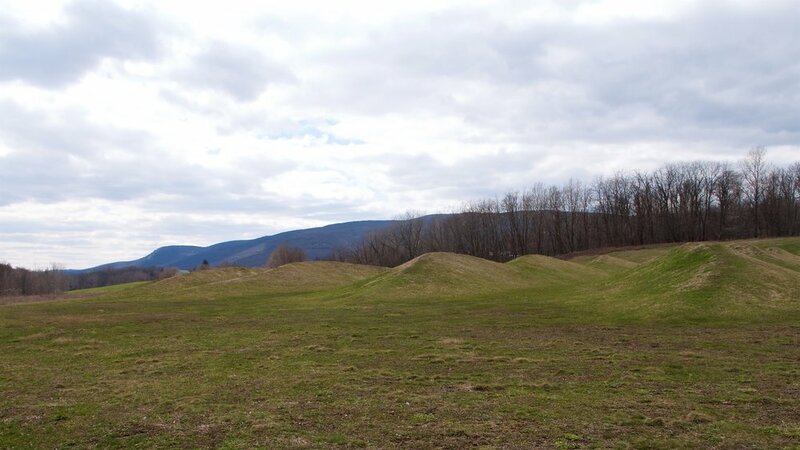 Maya Lin's Storm King Wavefield was technically closed, but all that meant was we couldn't walk among the grassy waves. We stumbled on this piece by accident, thinking the waves looked pretty unnatural. 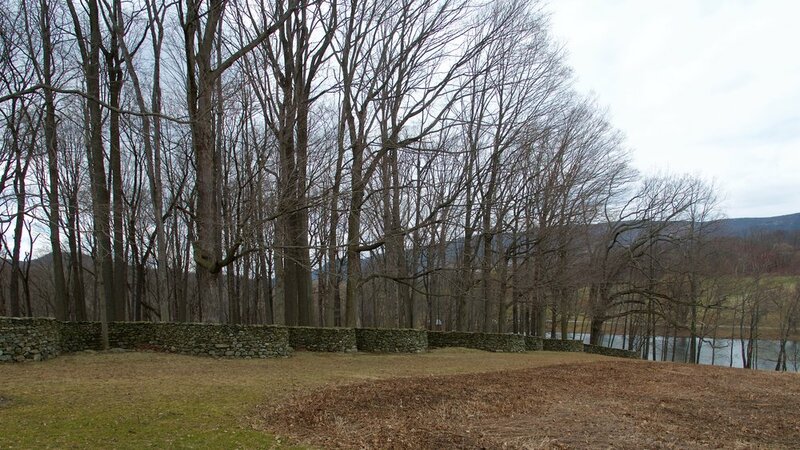 Andy Goldsworthy's Storm King Wall is another piece that at first glance doesn't seem like a piece of art. It's one that multiple people have mentioned to us, and it indeed makes quite the impression. 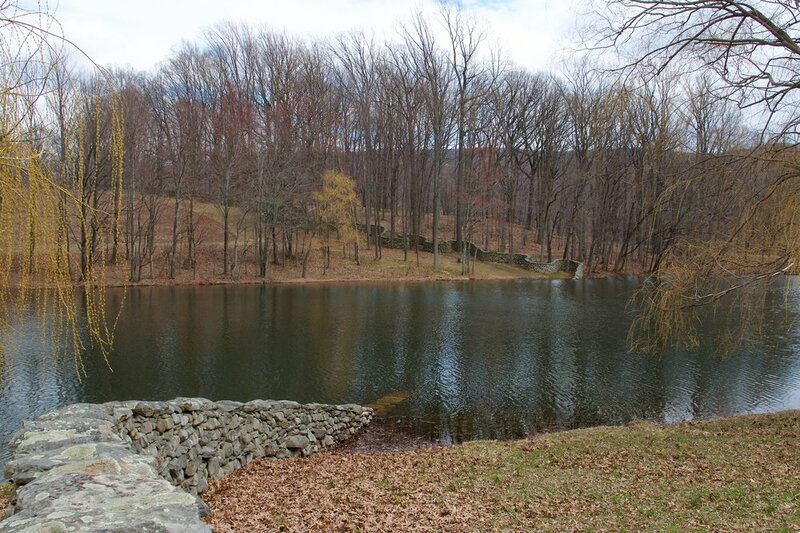 It's a stone wall that weaves between trees, up and then down a slope, eventually going into a lake and out the other side. It then has a break at the road, continues straight up another slope, breaks briefly for a pedestrian path, then ends at the top of the hill. George Cutt's Sea Change is mesmerizing, and we watched it for several minutes. It's a pair of thin, arcing poles which rotate, giving the illusion of rods that wave back and forth. We found several other pieces interesting, as well as the way the grounds were set up. Several works were positioned for great views all around, while there were some other views which didn't have art pieces in them but still seemed intentionally laid out. After leaving Storm King, we started heading back to New York City. While we were able to avoid tolls the previous day, it made more sense to cross toll bridges, one to cross the Hudson rather taking four hours to drive up to Albany and back, the other to get to Queens. We returned the car, then took the bus and train back to Marion's apartment. After dropping our things off, we went out to grab some ramen for dinner. Having dined, we stopped by Whole Foods to get a few things. It was surprisingly spacious, with most of the street-level floor being ready-to-eat items and the food bar. Most of the groceries were in the basement, which had quite a bit packed into little space. We made it back upstairs and got in line (“on line”) to check out. There were about a half-dozen lines, each a different color. A display rotated through the lines, telling the person at the front which of the few dozen express registers to go to. The system didn't require a lot of explanation and seemed to work pretty well. Our last stop was for gelato. 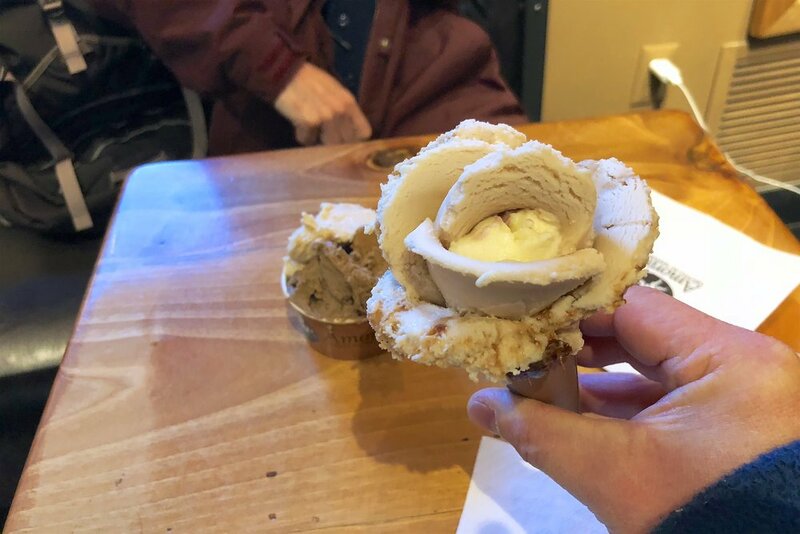 I usually get ice cream in a cup but opted for a cone this time since this particular store arranges the gelato to look like a flower in the cone. Cute. After that, it was back to the apartment. We didn't last very long before going to sleep.